Today we took a look at the exciting language learning app Mondly. It is well known and often suggested that the best way to learn a new language is to immerse yourself. Go to the country, meet the natives and dive in at the deep end. I think it’s fair to say that not everyone has the time, money, and confidence to do such a thing. With Mondly, you don’t have to! Mondly is a language learning app founded by two brothers from Brasov, Romania, Alexandru and Tudor Iliescuu (pictured below). The brothers always had a passion for language learning but found an issue with the existing apps: Robots. Not because robots were threatening the fate of humanity, that came later. The problem with all of the language apps on the market, at the time, was that when being taught the pronunciation of words, the speaker was very robotic. Much like Google Translate or the classic Microsoft Sam, which gave me many hours of enjoyment at school. With that, the brainstorm began and they created an app with more innovative features than you can shake a štap at (that's Croatian for 'stick'. Which, incidentally, is a language not available on Duolingo). The app itself is very well laid out and responsive with many different learning features – like matching written phrases to photos and intuitive speech recognition software allows you to convey with a conversation chatbot. It fuses the idea of education and gaming, tapping into our natural will to compete. Which of course encourages people to continue to develop their skills and not get bored. You pass modules to move onto different levels, accruing points which you can compare with your friends or a global leaderboard -this means you’ll be able to trash talk with your friends in a different language in no time! There are several features that stand out and improve upon previous language learning apps but the most exciting of all is the AR and VR features. Mondly is the first language app to use Augmented Reality and Virtual Reality. The VR version allows you take a virtual trip into the unknown with a helpful learning companion. 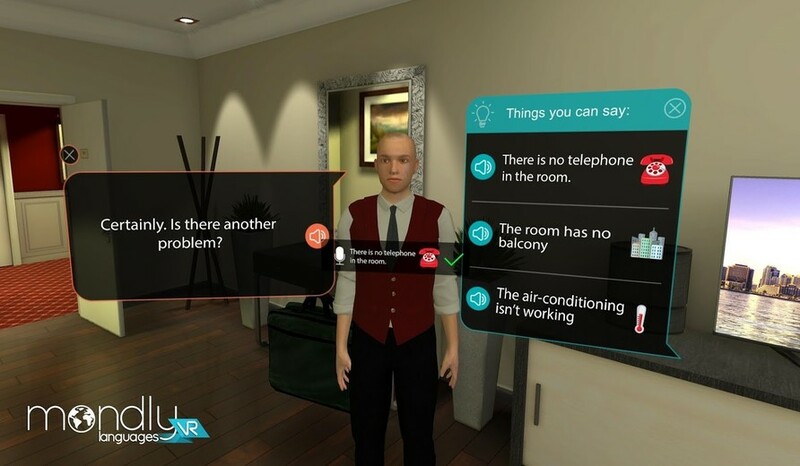 The virtual character accompanies you through authentic experiences such as: ordering a drink in a restaurant, complaining to hotel staff, or making friends on the train. This is of course much cheaper than buying a real drink, booking into a real hotel, or literally flying to another country. As for Augmented Reality… it’s a bit like being home-schooled in the future. Not only do you have a virtual tutor that converses with you and let’s you know where you've gone wrong, objects and animals appear too! For example: play the virtual guitar, stroke the virtual cat, and scream in terror at the life-size virtual elephant in your living room. Once you’re over the fright, you can appreciate how amazing this technology is, and what a great idea it was to use AR and VR for learning. In May 2017 Mondly introduced MondlyKids. An easy to use, child-friendly and fun version of the app aimed at children from ages 5-12. Great for expats with children to help them along with learning the native language of their new location. They make it so enjoyable that the kids won’t even realise they are learning. To summarize; this app has everything that I wanted from a language app. Comfortable, accurate, fun, and innovative are just a few words I’d use, and have used, to describe it.